Blog Home > Product Updates > What’s new at Skedler? v2.2.3, Dynetics Case Study and more. What’s new at Skedler? v2.2.3, Dynetics Case Study and more. Users got their hands on Skedler v2.2.3 in early August. V2.2.3 is a maintenance release to improve chart rendering in Centos and handling of Elasticsearch connection time-outs. In early July, we released Skedler v2.2.2. 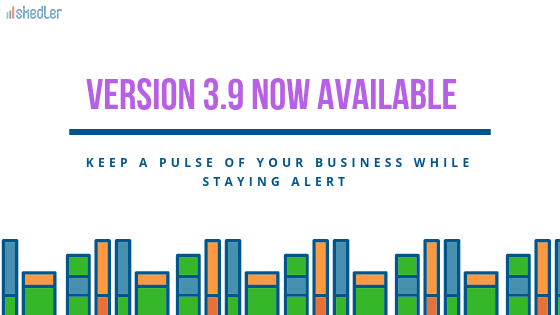 This release includes support for Microsoft Exchange server for emailing reports, an important request from several of our customers. It also includes enhancements to Kibana metric charts rendering and better handling of gmail as the email server. The license activation for Skedler is the simplest ever. Skedler licensing module automatically recognizes the Skedler edition and activates your license. 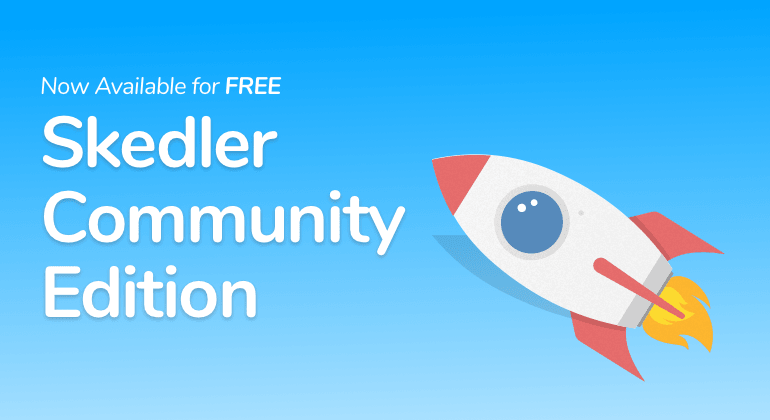 It is so easy to get started with Skedler now. Elasticsearch+Logstash+Kibana (ELK) stack is transforming from a log monitoring/search platform to a more widely used analytics, business intelligence, and monitoring platform. Every day we come across new use cases of how users are using Elasticsearch and Kibana to meet their business requirement. As ELK is becoming a common platform in the enterprise, Users are combining the ELK stack with Skedler for security monitoring, CRM, e-commerce and more. 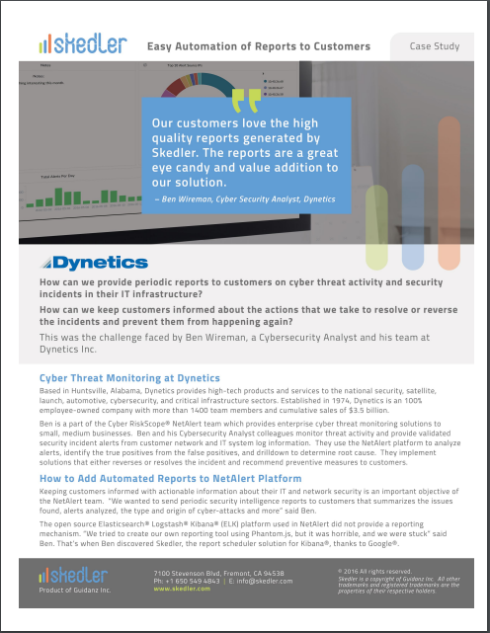 We are happy to share with you a case study on how Dynetics Inc. uses Elasticsearch+Kibana+Skedler to automate customer reports from its Cyber Riskscope® NetAlert platform. The case study will give you an overview how and why Dynetics chose Skedler to power reporting for its ELK platform. Would you like to share how you are using ELK and Skedler in your app? Our readers would love to hear from you. Just drop me a note to express your interest. Ask questions, get help with installation, Ask questions, get help with installation, suggest tips and tricks, and recommend new features. The Skedler forums is the place to be and discuss your questions with other users and developers. We invite you to start collaborating now. Did you notice the new Free Trial page? We have made it easy to download and try Skedler. After you download Skedler, please check your inbox and SPAM folder for an email from mailer@infusionmail.com. The email contains the license key to activate Skedler. If you don’t see an email with the license key, contact us at support@skedler.com. We understand that evaluating Skedler is an additional task that you take up in addition to your daily tasks. Therefore, we are constantly improving our process to make it easy for you to use Skedler. If you have any questions or suggestions, please contact us.